Born on 17 October 1857, Francis John Trewhitt was the son of John Trewhitt, a solicitor and notary public in Sunderland. As a young man, Jack was a champion amateur athlete. Like his father before him, he became a solicitor and later on a local councillor. On 8 October 1887 he married Ellen Cornell. The marriage produced four sons and two daughters. Jack Trewhitt died, aged only 45, on 19 July 1902. 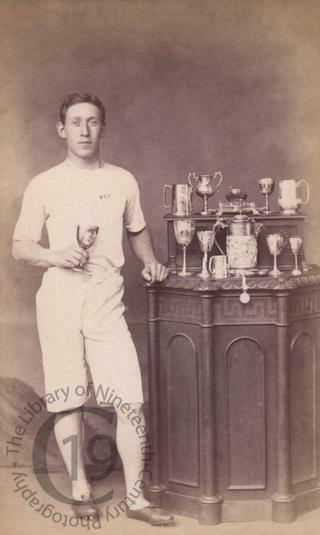 The following is taken from a very long obituary which appeared in the Sunderland Daily Echo (21 July 1902): 'During the early portion of his life he took a prominent part in local athletics and from 1876 up to within a few years ago he was one of the Sunderland Cricket Club's first eleven. In the course of his connection with the club he played against the Australians in 1880 on the Cheeter Road ground. As he runner he carried off many prizes, and for a number of years he figured in the half-back line of the the Sunderland Rugby Club. He was an active promoter of sport of all descriptions, and in his time filled the position of hon. secretary to the Sunderland Sports and the Sunderland Rugby Union, before its amalgamation with the Sunderland Cricket Club. He took a prominent part in securing the new ground at Ashbrooke, and was one of the trustees of the Sunderland Cricket and Football Club. He never, in fact, lost his keen interest in athletics, although business prevented his indulging in it, and his love of outdoor exercise was shown in his fondness for cycling, a pastime in which he actively engaged. Photographed by Stabler and Fries of Sunderland.